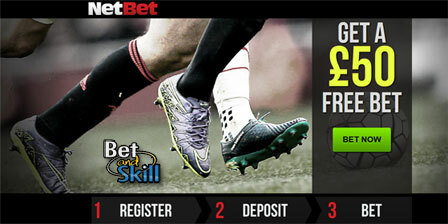 New bookmaker Netbet is offering a £50 free bet on you first deposit. Open an account via our special links and banner and make your first deposit using bonus code WELCOME50 to get 50% welcome bonus up to £/€100. Find here all the details. Open a new account with Netbet! You will be awarded a 50% bonus on your first deposit up to £50 (or equivalent currency). For example, if your first deposit is £100 we will credit you with a £50 bonus. "NetBet Sports: 50% on your first deposit up to £50 free bet"